1967 class graduates should register following the first time visitors instructions. At our age, we can hide our own Easter Eggs, wait half an hour, and have no clue where we left them. 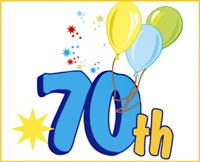 If you missed the 50th anniversary reunion, the 70th Birthday gathering is an opportunity to catch up with old friends during State Fair Week. Make your plans now to join us.